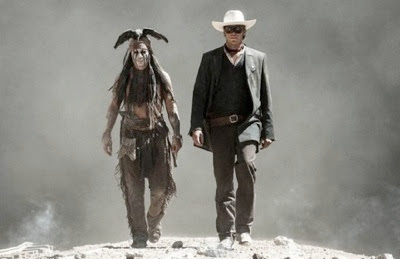 Johnny Depp's Tonto basically is Jack Sparrow with more face paint and a dead crow on his head in this tongue-in-cheek retelling of "The Lone Ranger," while Armie Hammer's title character is so pureheartedly Dudley Do-Rightish he's like a genetically perfected and bigger Brendan Fraser. But it's not as if anyone should have expected "Rango" and three-time "Pirates of the Caribbean" director Gore Verbinski's ridiculous reboot to be redolent with "Red River" realism. Even if this inconsistent farce feels far too long, it's hard to hate something that's so energetically eager to please. Depp steals the show as the tersely deadpan Tonto, a Buster Keatonesque stoneface who completely perplexes palefaces. Never cracking a smile or breaking a sweat, he manages to make flat pronouncements such as "something very wrong with that horse" hilarious. In the movie's opening and other scenes, an ancient and addled Tonto (looking as wrinkled and weathered as a latter days "Little Big Man") is recounting his bygone adventures to a Lone Ranger-costumed boy at a 1933 sideshow exhibit. What's surprising is how much convincing melancholy Depp brings to those segments, like a loopier version of Puyi telling his tale in "The Last Emperor." This device lets us see the story's 1869 events through an unreliable-narrator filter that means things can be silly, strange and generally more suspect than the conventional Lone Ranger legend. What's odd, and kind of unfortunate, is that the movie doesn't make more use of that license to go wall-to-wall "Blazing Saddles" batty. Instead of being a full-on crazy comedy, the movie includes a subplot about railroad-tycoon corruption and some graphically high body-count train hijackings, with a few brutal massacres by outlaws and the US Cavalry thrown in. Villain Butch Cavendish (William Fichtner), who looks like a gold-toothed and gruesome escapee from "The Walking Dead," literally cuts the heart out of one of his victims. Ouch. Meanwhile, Hammer is naively noble and square-jawed as Reid, who dons the Lone Ranger mask after his brother lawman is shot down in an ambush. Chosen for greatness by the white "spirit horse" he later will name Silver, Reid forms an uneasy alliance with the entertainingly eccentric Tonto, who has a habit of trying to feed the dead bird he constantly wears on his head. The movie's stunts are as elaborate as those in the four "Pirates of the Caribbean" movies scripted by "Lone Ranger" co-writers Ted Elliott and Terry Rossio. Many of those wild wild west scenes also happen to be as incomprehensible as their high-seas forerunners, so just hold on and enjoy the ride. A lengthy finale in which two locomotives chase each other, become detached, become reattached and go on and off sidetracks is as exciting but hard to follow as the ships-in-a-maelstrom bit in the third "Pirates" flick. It's also pretty funny, though, especially the part involving Tonto's creative use of a very long ladder. Ruth Wilson (TV's "Luther") stars as Reid's former sweetheart sister-in-law Rebecca, resembling an Old West stiff-upper-lip hybrid of Emma Stone and Ellen Pompeo. Helena Bonham Carter has a small role as a one-legged madam, and Tom Wilkinson is suitably vile as greedy railroad builder Latham Cole. Beautiful scenery and some impressive special effects (such as a violently derailed train skidding sideways across the landscape toward Our Heroes) are enhanced by the fact that this is one of the few big-budget spectaculars in recent years that is not ruined by 3D. Three cheers for Verbinski and the producers for bucking that aggravating trend. "The Lone Ranger" has its problems, but Depp is a lot of fun to watch in both his serious and surreal scenes. Plus how many other movies this year are likely to feature a hat-wearing horse standing in a tree?